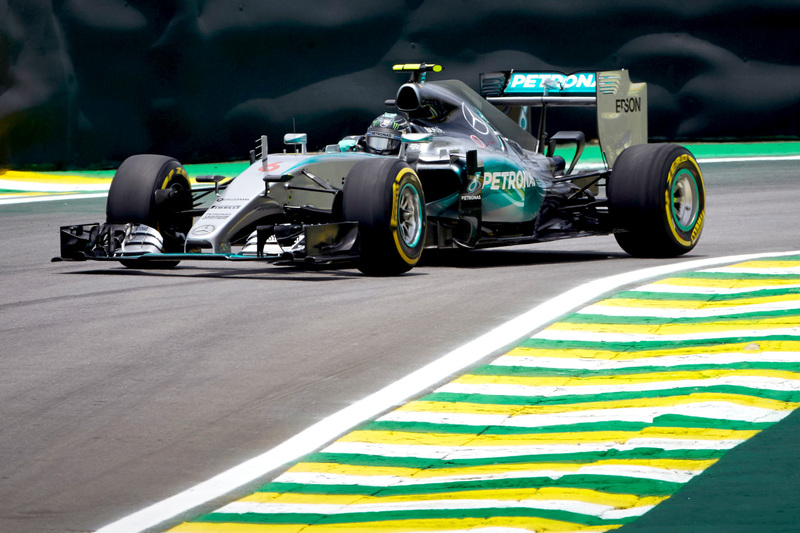 Nico Rosberg has recorded a commanding victory at the Brazilian Grand Prix to secure second place in the drivers championship. The German powered cleanly off the line, defended against an aggressive attempt to push him off line by teammate Lewis Hamilton at the first turn, and kept the Briton at arm’s length from there. Though the gap between the battling Mercedes cars, quick enough to be in a race of their own, intermittently closed to less than a second, Hamilton complained of being unable to find a way past the leading silver car before being forced to drop back with high tyre wear. In keeping with team protocol — which Rosberg, as the man who more frequently trailed his teammate this season, would know too well — Hamilton was denied an alternative strategy for his second and third pit stops, from which he offered no further credible challenge for the lead. “It was a great weekend to win here,” said Rosberg. “Very happy, It went perfectly. “Lewis put on a good challenge, but I was able to control it and never give him a chance. Season-long observers have noted late-season Rosberg, with the title realistically and later mathematically lost, is performing more confidently than at the beginning of the year. Rosberg denied, however, that the absence of championship pressure or anger over a number of moves put on him by Hamilton he considered out of order were behind the upturn in form. “I’m pushing now, and I was pushing at the beginning of the season,” he insisted. “I’ve been working hard. Lewis had the upper hand for a lot of the season. At the moment it’s going really well. Hamilton, who explained away his fifth consecutive loss of pole position to his teammate on Saturday because his “job is done” after winning the drivers championships, said his loss was a function of the circuit, around which overtaking is notoriously difficult. “I had good pace,” he said. “It’s just you can’t overtake here. “I was obviously behind Nico and in traffic for some time, and it just killed my tyres. Hamilton also complained to his team over the pit-to-car radio that he couldn’t be switched to a more aggressive strategy to try to usurp his teammate, in contravention of his team’s long-running deal to give advantage to whichever car is leading on the track. Sebastian Vettel and Kimi Räikkönen held their third and fourth grid places, with the German just 6.4 seconds behind Hamilton. Vettel ran an alternative three-stop soft-medium-soft-medium strategy, in contrast to his teammate, who tried to two-stop his way to the end with a soft-medium-medium combination, explaining the 33-second gap to his teammate. “I think it was a good race for us,” said Vettel. “I was hoping at the start we could do something, but it wasn’t possible. “Overall I think we have to admit [Mercedes] were just a bit quicker, but I think we were probably closer here than at other races on race pace. Valtteri Bottas finished fifth, bringing home 10 points to secure third place for Williams in the constructors championship. Bottas started in seventh after a three-place grid penalty for passing under red flag conditions during Friday practice dropped him from fourth. Most of the Finn’s hard work came on the first lap, however, jumping Nico Hülkenberg and Daniil Kvyat, the chief beneficiaries of his penalty, and ended the race 16 seconds up the road, but half a minute behind the Ferrari driven by his compatriot. Hülkenberg’s afternoon was substantially busier than Bottas’, however, defending against Daniil Kvyat, who himself finished just five second ahead of Felipe Massa, in positions six, seven, and eight. Williams, however, is due to appear before the stewards for a possible breach of tyre temperature regulations after Pirelli recorded his starting medium tyres resting at an unusually high temperature on the grid. Romain Grosjean, P9, muscled his way past Max Verstappen, P10, who was on an identical soft-medium-medium-soft strategy, to claim his Lotus team’s only points. Grosjean’s Lotus teammate Pastor Maldonado finished tenth, having been slapped with a five-second penalty in the race for punting Sauber’s Marcus Ericsson off the track at turn one at mid-distance. Daniel Ricciardo finished the race without points in P12 after spending his afternoon mired in the further reaches of the midfield, a 10-place grid penalty for taking Renault’s new power unit forcing him to start from the penultimate place on the grid. The power unit did not mark a significant improvement, however, and on a circuit not conducive to passing, the Australian struggled to claw his way into the points. Sergio Perez’s run of good form came to an end in Brazil, the Mexican able to claim a paltry P13 and no points, ahead Felipe Nasr’s Sauber the two McLarens led by Jenson Button, Marcus Ericsson in the second Sauber, and Will Stevens and Alexander Rossi’s Manor cars, the latter of whom drove his final race of the season.